This is the last post on the short caries interpretation series and it will be about recurrent caries. 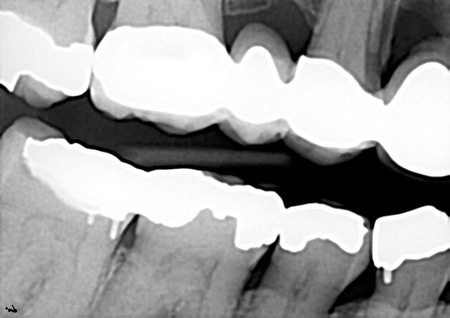 When evaluating for recurrent caries look for a diffuse radiolucent area going away from the existing restoration margins typically towards the pulp chamber. Note the diffuse radiolucent areas apical to the interproximal restorations of the lateral incisor and canine. There are a couple of things to be aware of when evaluating for recurrent caries. One is a void or liner in the prep. This will be evident as a well-defined radiolucent area adjacent to an existing restoration. The second is Mach effect, which is an optical illusion created by the brain when there are two significantly different densities adjacent to each other. This commonly occurs with a metallic restoration and dentin. It will also appear as a well-defined radiolucent line that follows the outline of the restoration. A pseudo-Mach effect can also occur with computer manipulation of a digital image (usually too much edge enhancement used). Note the radiolucent line following the restoration of the mandibular first premolar caused by over enhancing the image. Practice radiographs coming later today. If you have any questions or comments, please leave them below. Thanks and enjoy! Love your website – it has been a great help for my dental hygiene students! Thanks. If there are any areas you’d like to me add please let me know and I’ll do my best. is this recurrent caries on mesial of 4.6? 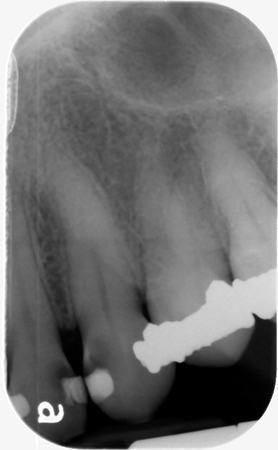 That could be either recurrent caries or an open margin. Hoe does a mach effect looks like? Mach effect will appear as a radiolucent line between two strongly contrasting areas on an image (typically a metallic restoration and dentin) as our eyes struggle with this contrast.